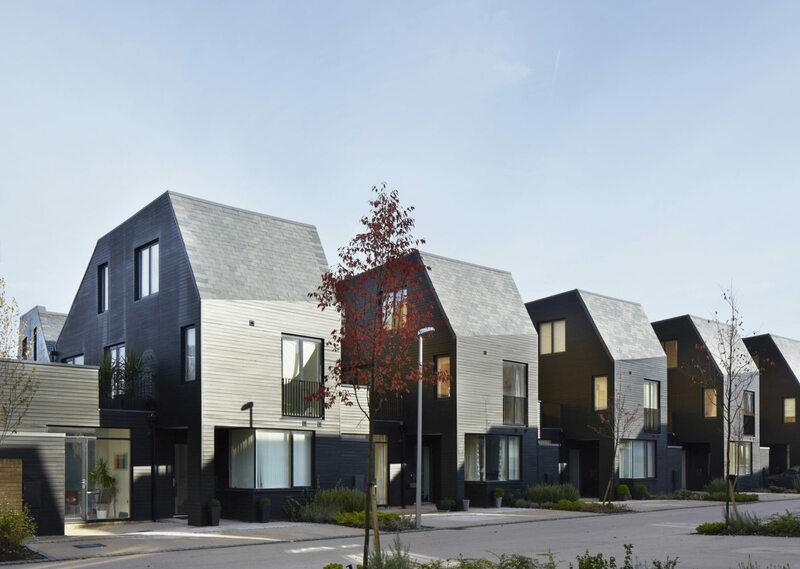 “Newhall Be demonstrates the added value that good architects can bring to the thorny problem of housing people outside our major cities. 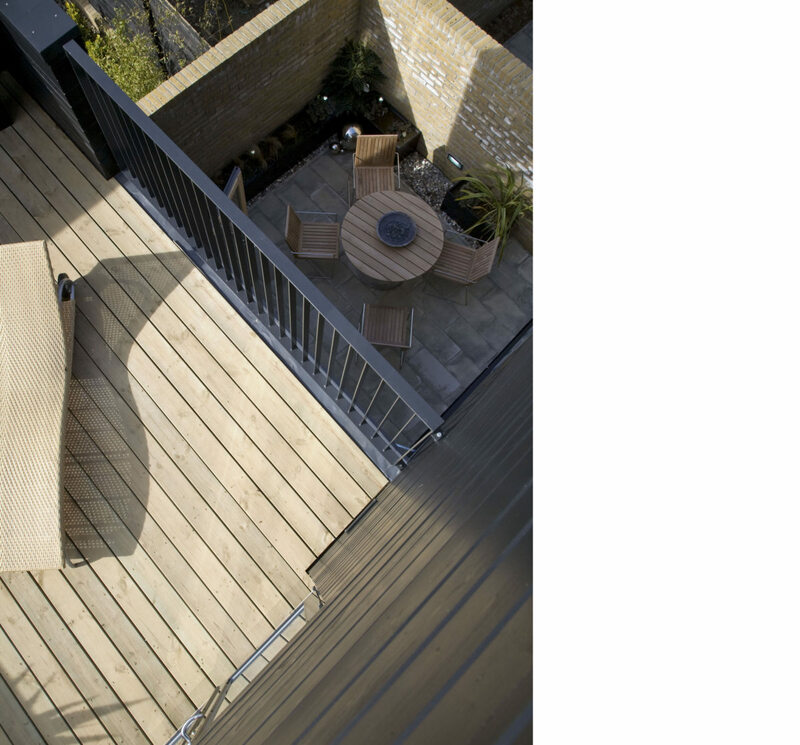 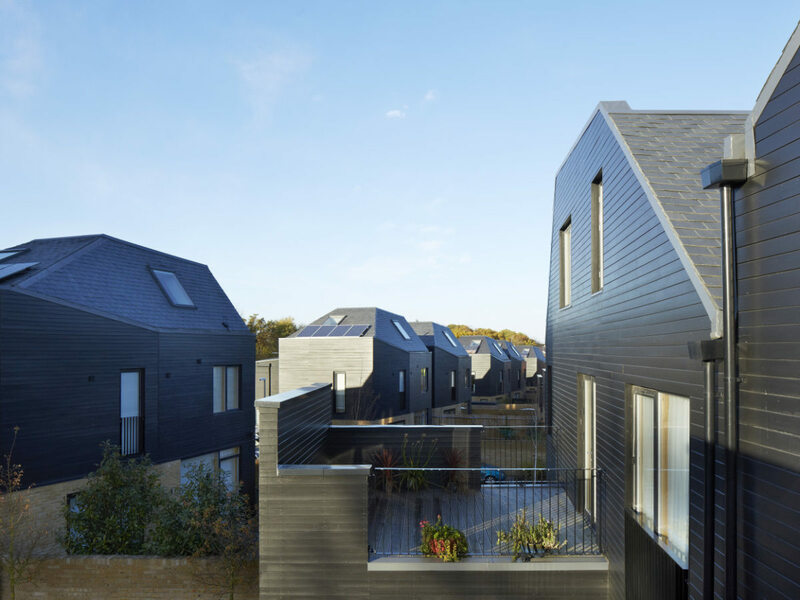 By halving the size of the gardens – creating roof terraces in total equalling the land ‘lost’ – the architects fitted an extra eight houses on to the development. 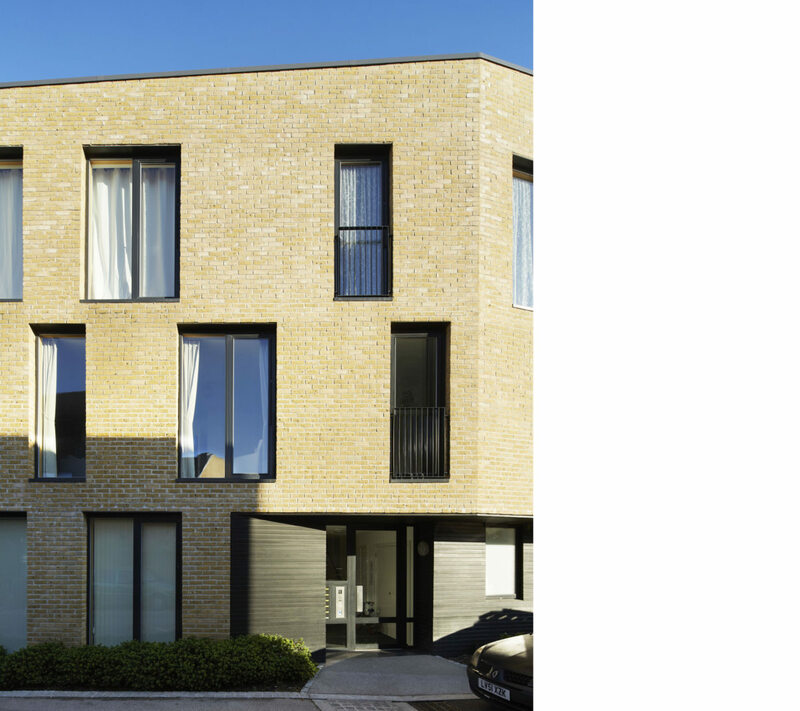 This paid for extras such as full-height windows, dedicated studies and convertible roof spaces. 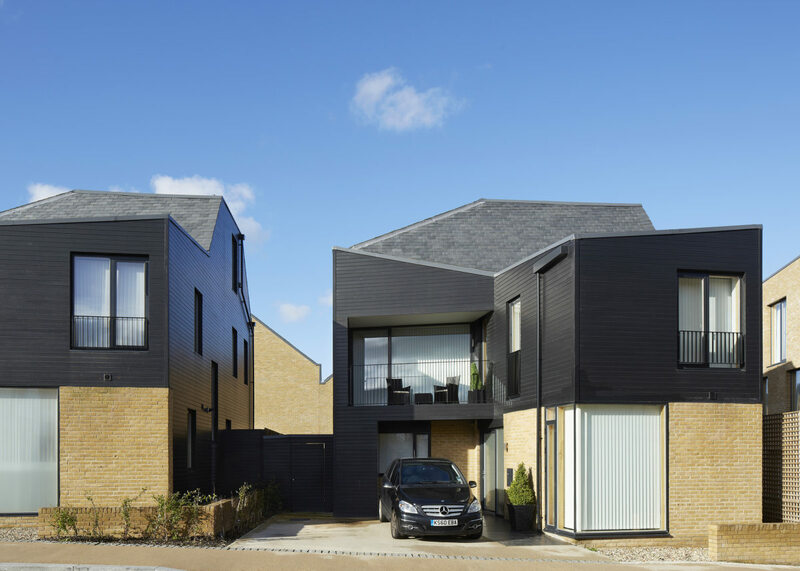 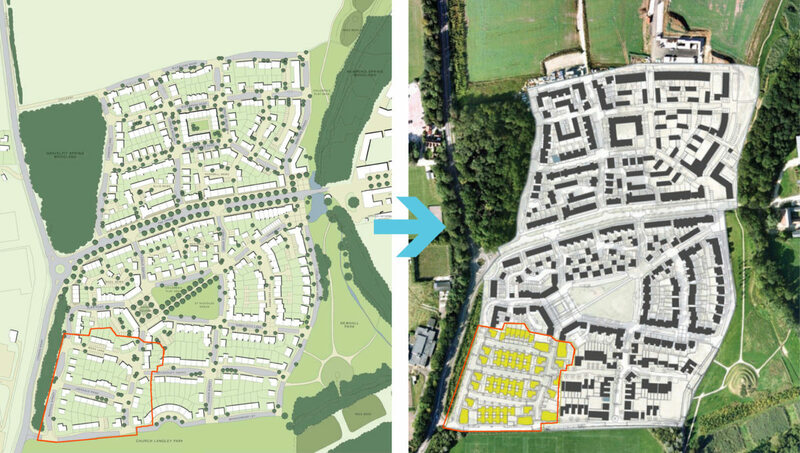 The overall scheme raises the bar for suburban housing so that, if emulated, could and should have a significant impact on development across the country. 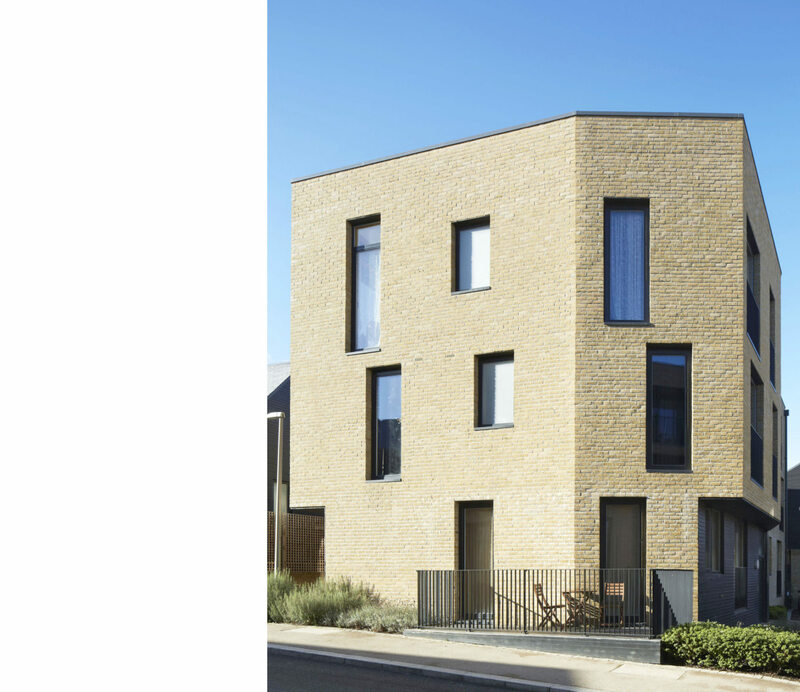 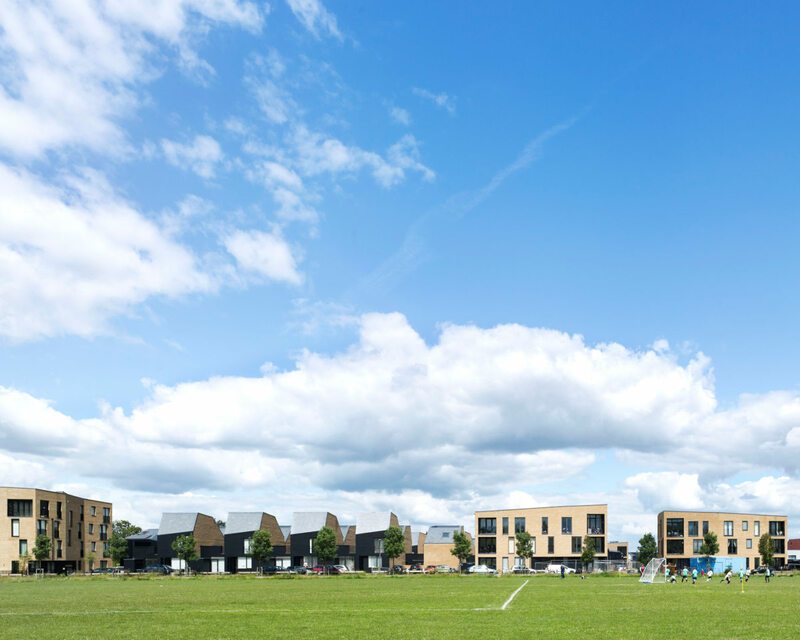 This 84-unit scheme for Linden Homes completes the South Chase of Phase 1 of the award-winning Newhall development in Harlow, Essex. 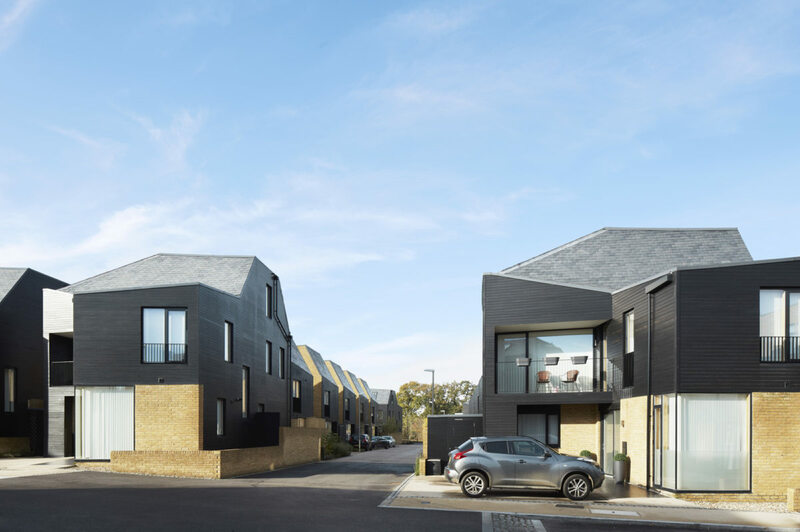 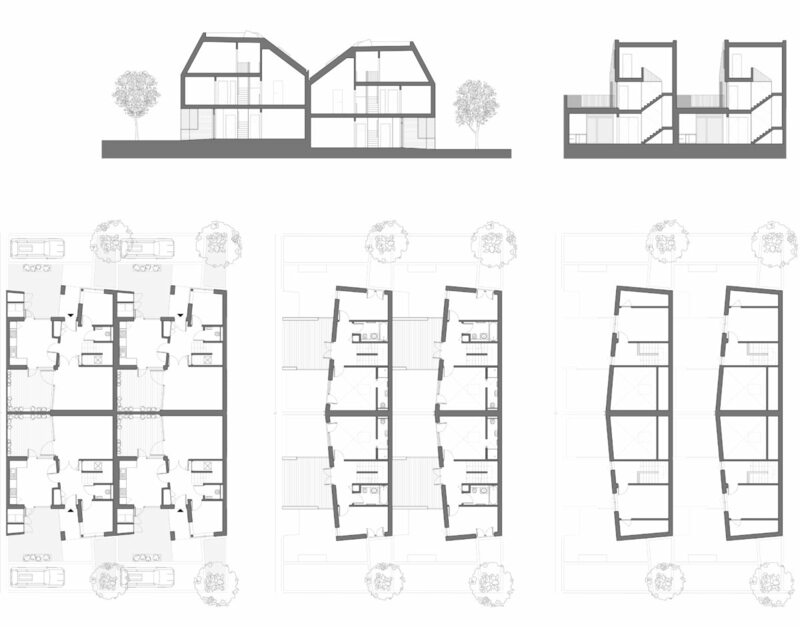 ABA’s approach integrates a mix of new and familiar house typologies, prefabricated timber construction and a highly efficient masterplan to maximize living space and flexibility for individual homes. 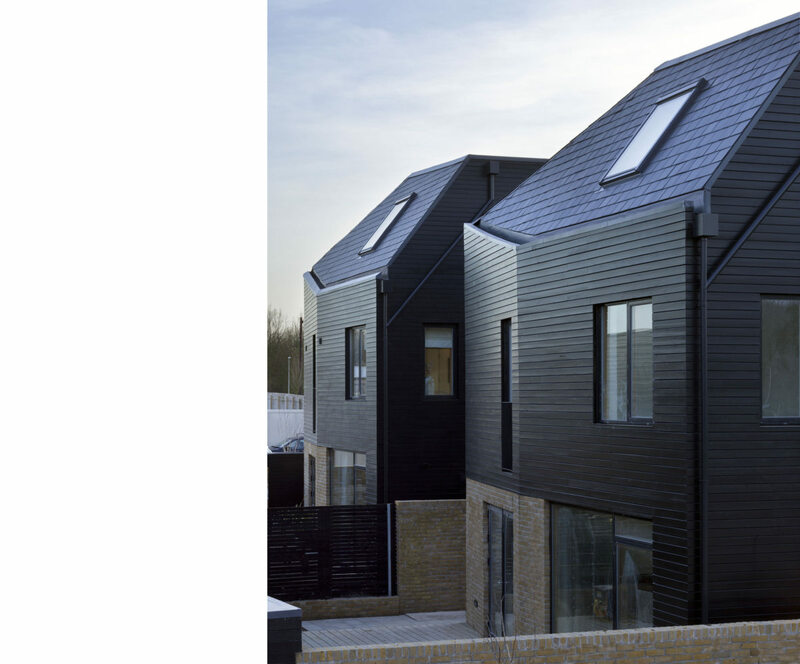 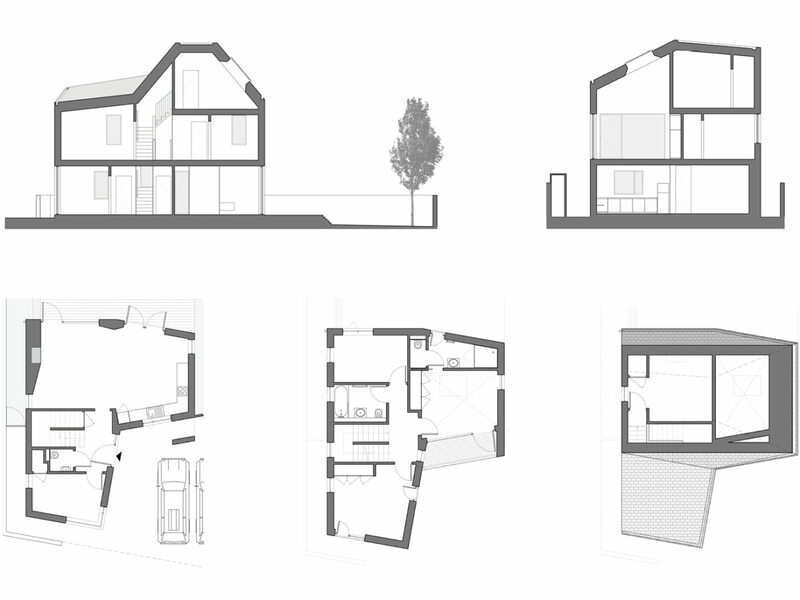 The scheme’s geometric and material consistency was inspired by the powerful roof forms and simple materials of Essex’s rural buildings. 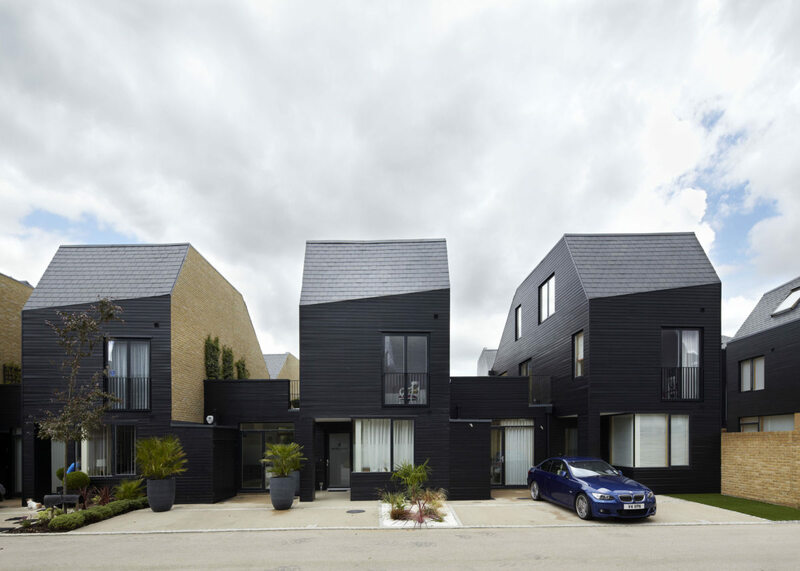 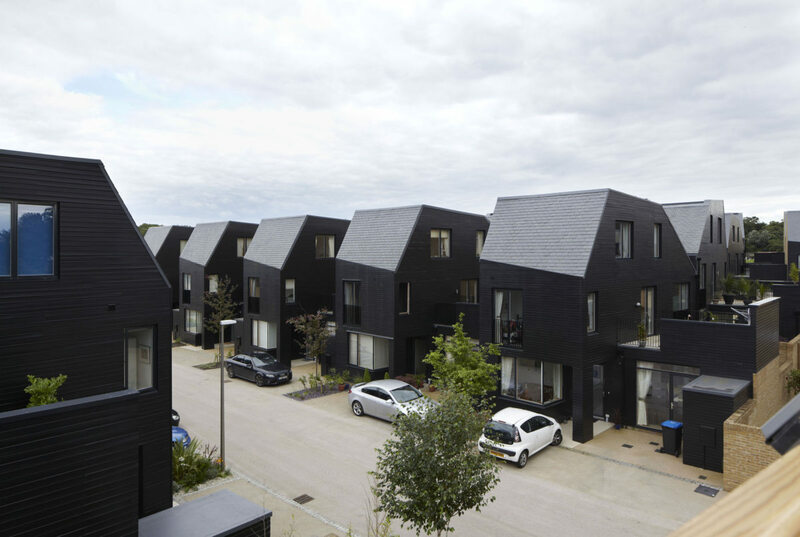 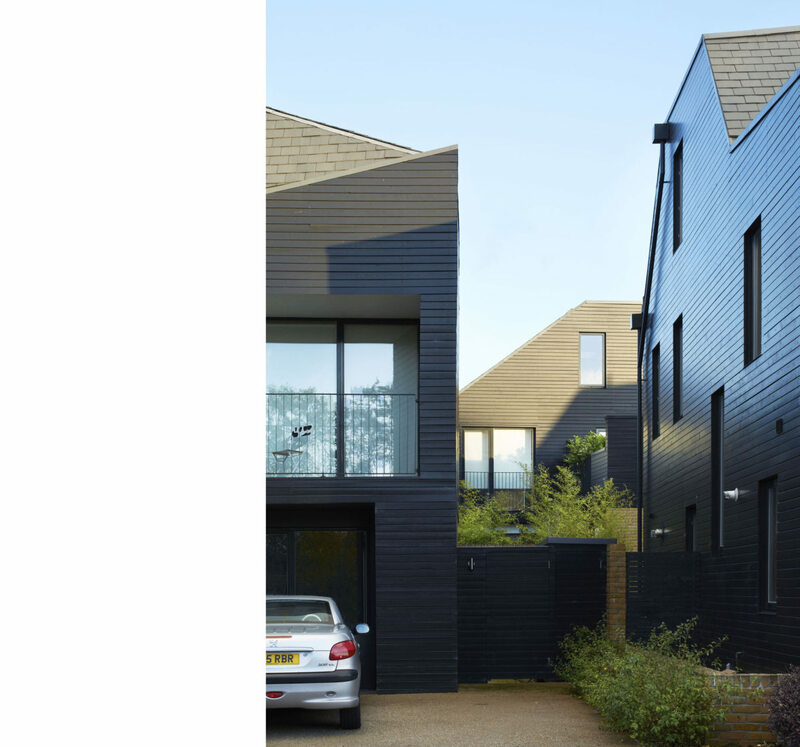 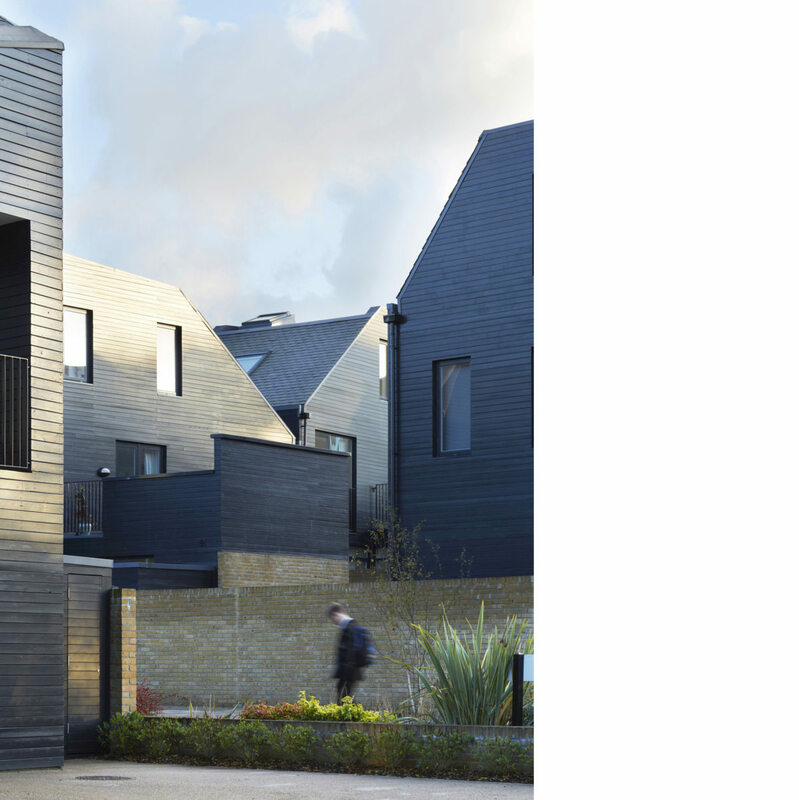 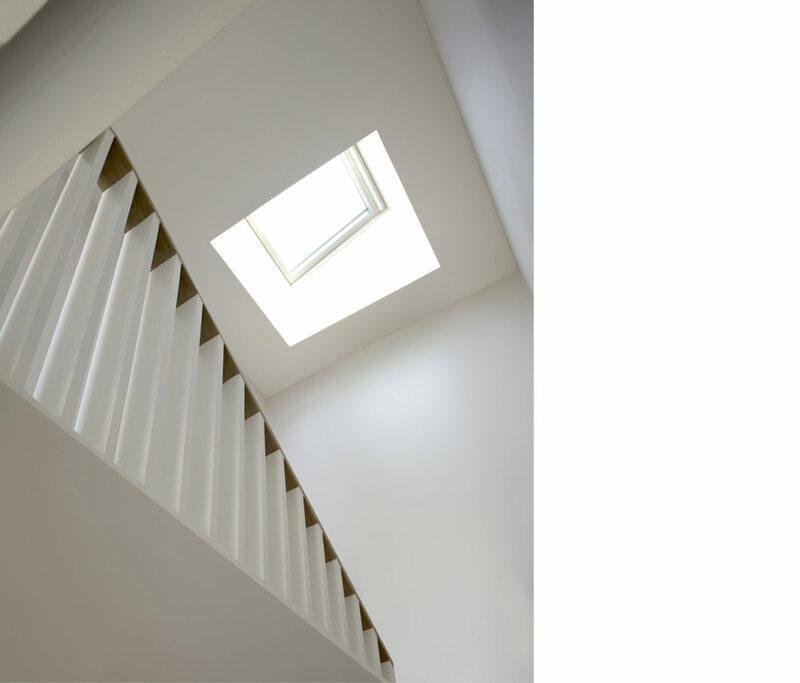 ABA has utilised these geometries to bring light into terraced courtyard houses, allow rooms in the roof, permit oblique views to the landscape beyond the site, and to introduce a sculptural rhythm to the scheme’s streetscapes. 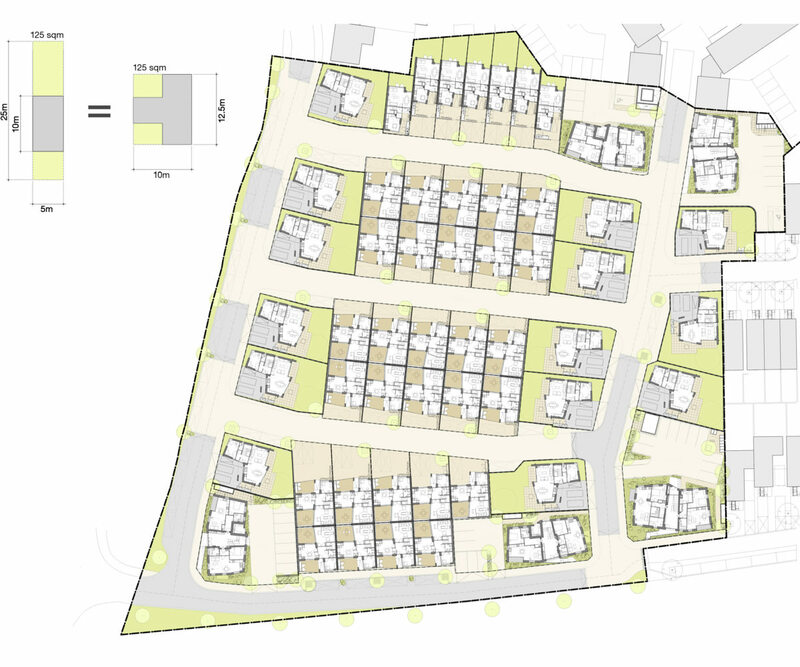 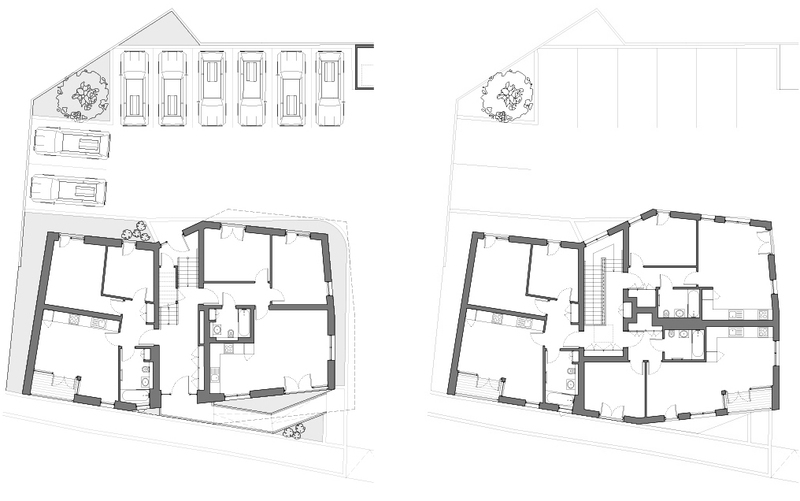 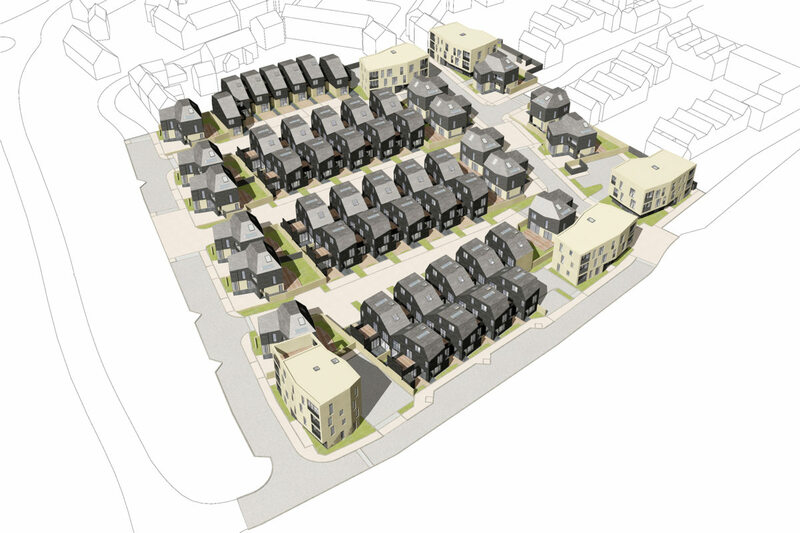 The development consists of 84 units across four building types; 5 Apartment buildings containing 6,7 or 8 flats each; 14 Villas; 29 Courtyard Houses and 7 Terraced Houses totalling 84 units, 26% of which are affordable. 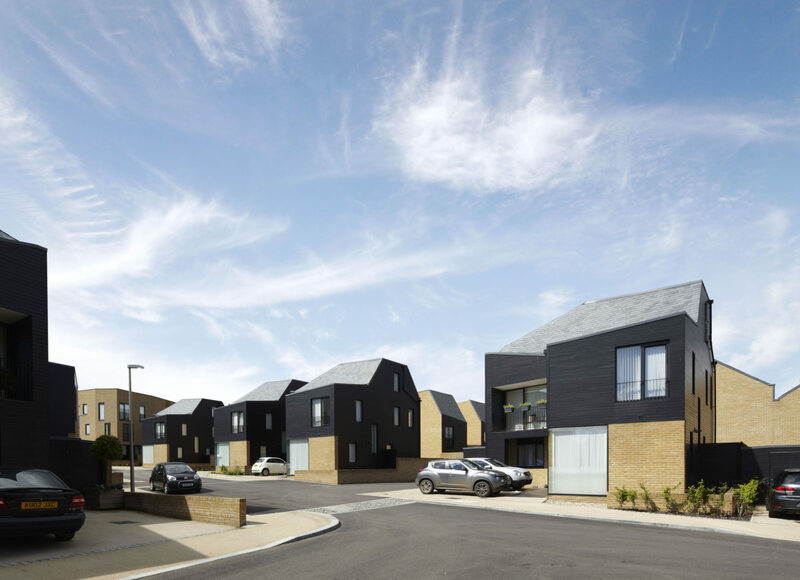 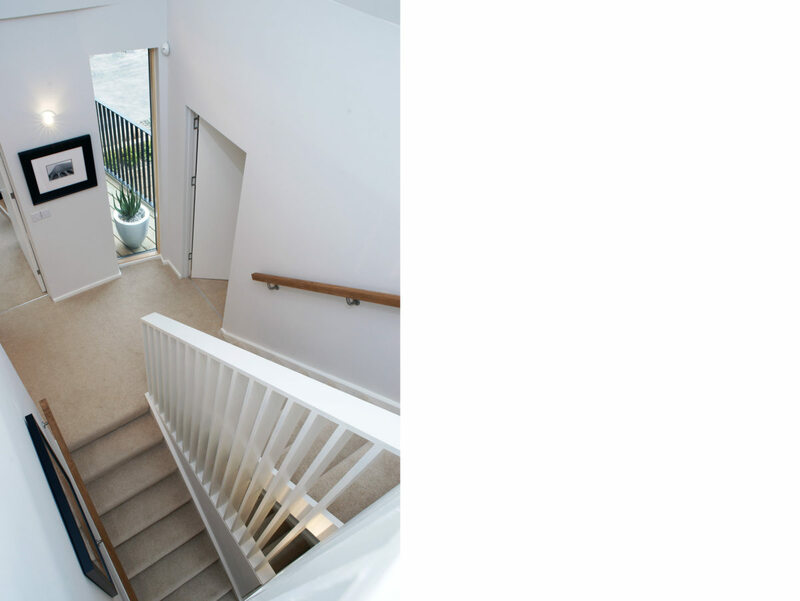 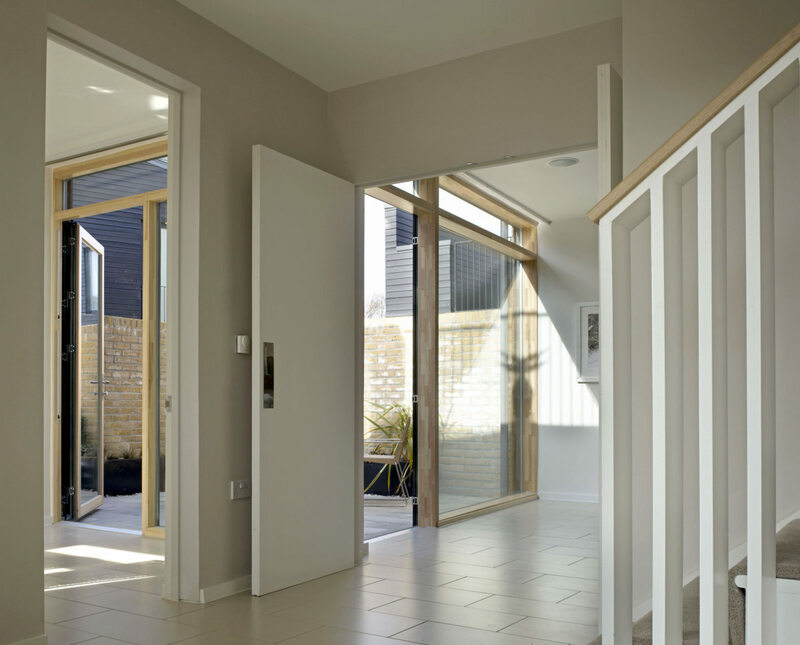 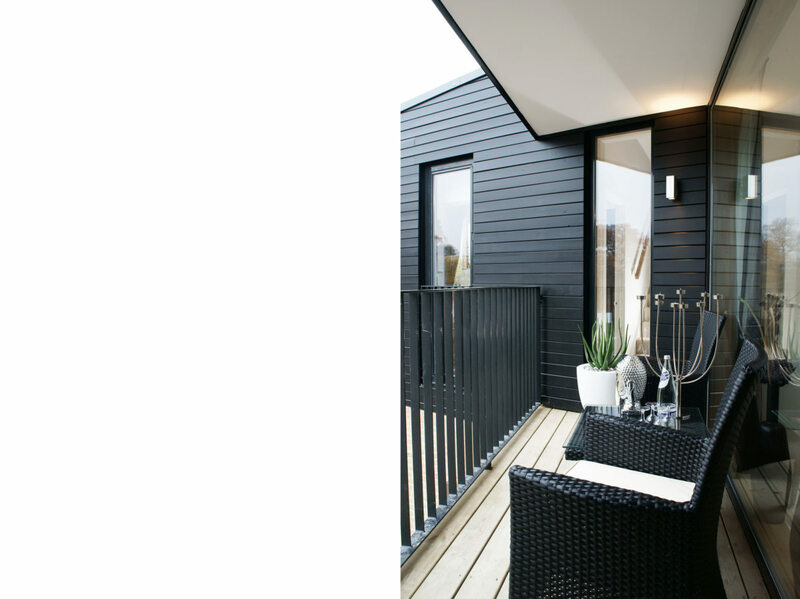 The Development is highly sustainable and is built to Lifetime Homes Standards. 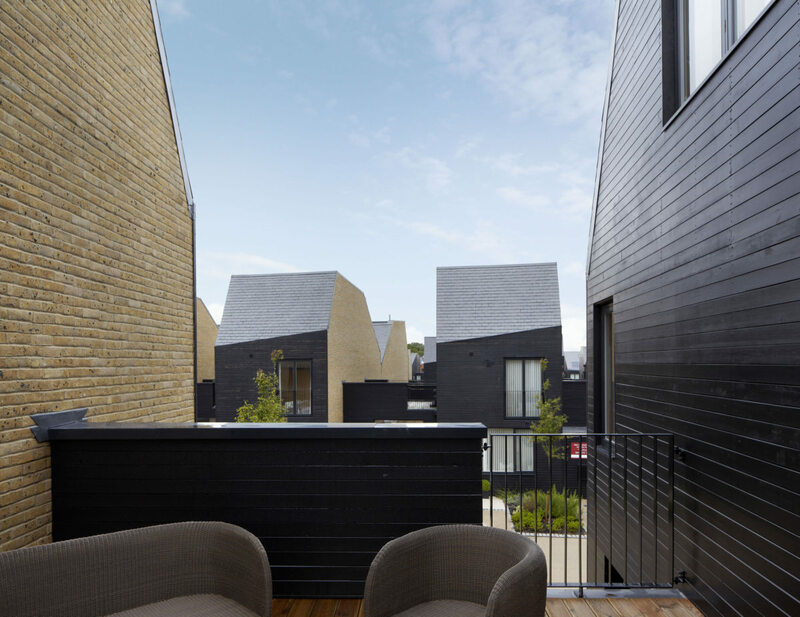 All housing types incorporate covered front porches, central stair halls, roof terraces, Juliette balconies and cathedral ceilings. 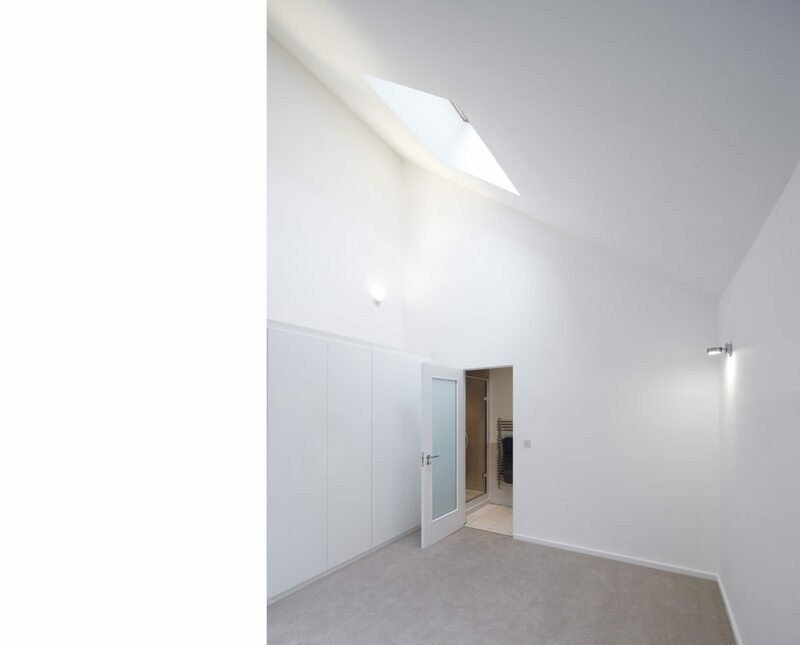 Loft spaces either finished as bedrooms or can be retrofitted by homebuyers as workspaces, additional bedrooms or games rooms. 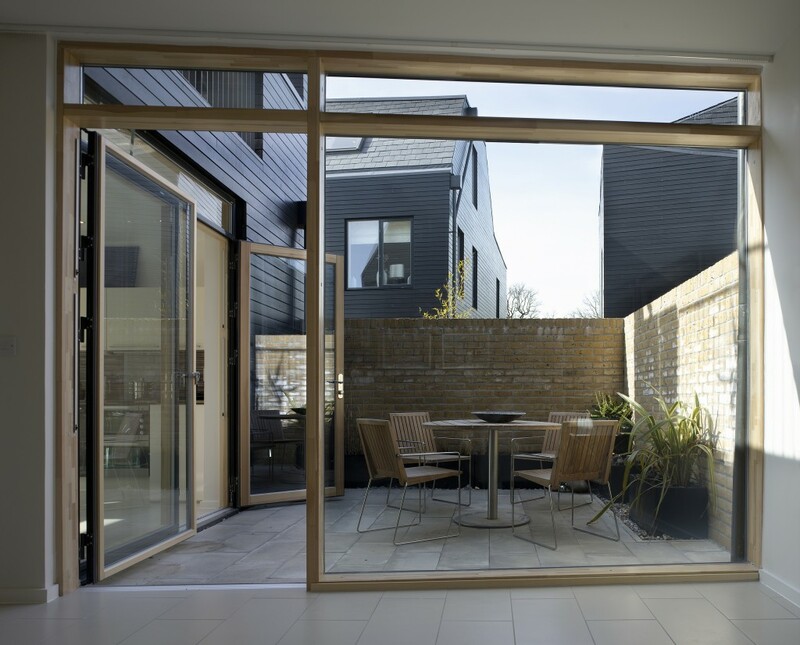 Villas and Courtyard houses all have a ground floor study – ABA consider this additional room as essential for accommodating the electronic media and home working lifestyles of the 21st century.